This little joint is easy to miss – either because of its obscure nature, or perhaps because it just doesn’t really look like an eatery. Ignore this restaurant at your peril, as it is a true hidden gem, and one of the best keep secrets in the fish market. Keep your eyes open. Opening every day at the crack of dawn (5am to be precise) the understated establishment predominantly serves the staff and workers of the Aberdeen Fish Market. It provides normal cha chaan teng food such as instant noodles with eggs and sausage, toast with condensed milk and butter, and local style coffee and milk tea with all the trimmings. But during lunch hours, you will find a totally different scene. 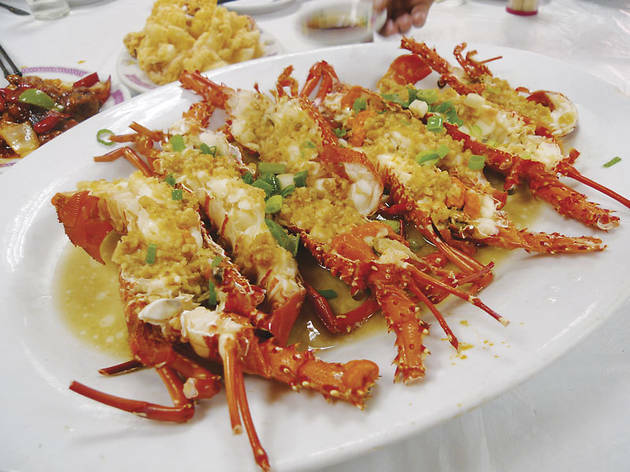 Every single table is filled with different kinds of seafood dishes, such as steamed giant grouper, deep fried squid seasoned with salt and pepper, and baked lobster with cheese. And the reason is simple: the owner can receive the freshest ingredients direct from the market every day. Welcome to the best seafood restaurant in Aberdeen. There is no formal menu for the seafood lunch, the only thing you need to do is to tell the owner, Ar Lo, how much you want to spend per head, from $200 to $400, and he will simply source the best seafood according to your budget with the most appropriate cooking method as well. Four of us came here for lunch on a Tuesday afternoon, opting to spend $350 per head and, unsurprisingly, it turned out to be the best seafood meal that I have had this year. 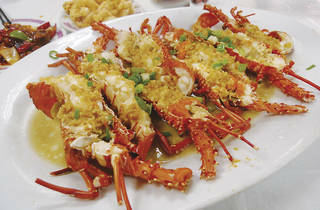 The steamed lobster was easily everybody’s favourite, unlike most lobsters from other seafood restaurants. What we were treated to were “lime lobsters” that could only be “collected” directly from fish boats in the Aberdeen Shelter. They were smaller in size but ten times sweeter and richer in taste. They were also crunchier, with a tender texture deep in oceanic flavor. The steamed yellow fin bream was another star. It was a wild, fresh sea fish that you would be hard-pressed to find elsewhere other than the fish market here since they are usually all reserved by “insiders” like Ar Lo. It was cooked so perfectly that the flesh was meltingly tender with superb fish flavour, and we ended up eating everything including the main bone. OK, maybe not, but if we could have, we would have. Other dishes were also of the highest quality. The fried squid with salt and chili was fried to a light golden brown, crispy on the outside and somewhat chewy and crunchy on the inside. The squid was of such good quality that their flesh was thicker than ones you would normally see. The deep fried abalone is one of the signature dishes at the Michelin-starred seafood restaurant Loaf On in Sai Kung, but you can find the dish here reaching the same level of quality and at a cheaper price. The abalone was lightly seasoned with black pepper, which gave it a tasty, juicy and bouncy feel. It’s simply a dish that you can’t miss. The only question that remains now is, when will our next visit be? G/F, 102 Shek Pai Wan Rd, Aberdeen, 2552 7555. Daily 5am-2.30pm. Meal for two: around $700.